What draws ‘lone wolves’ to the Islamic State? 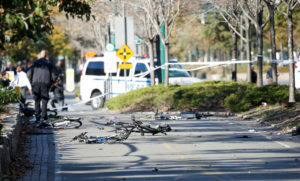 The recent attack on a bike path in lower Manhattan once again compels us to ask: Why do people pledge allegiance to the Islamic State? Sayfullo Saipov, the suspect in the attack, isn’t a devout Muslim. He cursed and came late to prayers, according to acquaintances who talked to The New York Times. So why would he want to be a martyr? As a professor of modern Middle Eastern history, I have spent the majority of my professional life studying the region, its culture, society and politics. In recent years, I have researched and written about IS and its terrorist activities. While other experts and I have long looked at how radicalization occurs, some new ideas are emerging. Radicalization refers to a step-by-step process whereby individuals become increasingly susceptible to jihadi ideas. First, they cut themselves off from social networks such as family, which provide them with support and a conventional value system. They then immerse themselves in a radical religious counterculture. They might do this on their own, or a jihadi recruiter might bring them into the fold. Either way, the result is the same. Some observers claim IS propaganda plays a key role in recruitment. Rather than presenting a religious rationale for the group’s actions, IS propaganda tends to focus on the violence the group perpetrates. IS has even released a video game based on Grand Theft Auto 5 in which, rather than stealing cars and battling the police, the player destroys advancing personnel carriers and shoots enemy soldiers. Perhaps, then, the radicalization model is wrong or not universally applicable. Perhaps there’s something other than religious zealotry at play. Consider the widely reported story of two would-be jihadists who, before they left Birmingham, U.K., for Syria, ordered “Islam for Dummies” and “The Koran for Dummies” to fill the gaps in their knowledge. Newspaper stories time and again puzzle over the problem of how it happens that individuals who go on to join IS were found in bars, even gay bars, or had Western girlfriends and smoked and drank almost up to the time they committed some act of violence for the group. The most common explanation is that their dissolute lifestyle was a cover. After the driver of a truck ran down and killed 84 people in Nice, France, for example, the French interior minister was at a loss to explain how someone who drank during Ramadan – which had ended a week and a half before – could have radicalized so quickly. A number of experts have argued that the radicalization model should be replaced by, or supplemented with, a different model. Could it be that IS volunteers are drawn to a value system that asserts an aggressive machismo, disparages steady work and sustains the impulse for immediate gratification? Could it be that they are attracted to a culture that promotes redemption through violence, loyalty, patriarchal values, thrill-seeking to the point of martyrdom and the diminution of women to objects of pleasure? In this reading, IS more closely resembles the sort of street gang with which many of its Western and Westernized enlistees are familiar than its more austere competitor, al-Qaida. James L. Gelvin is a Professor of Modern Middle Eastern History at the University of California, Los Angeles. This article was originally published on The Conversation. Read the original article.